Island Style Classic Slot Guide & Review - Casino Answers! 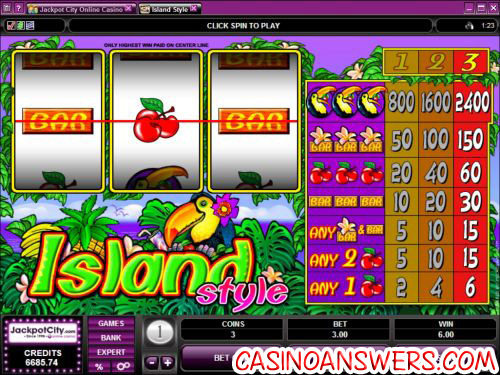 Island Style is a 3-reel, 1-line classic slot machine developed by Microgaming. You can play the Island Style classic slot machine game at King Neptunes Casino and First Web Casino. The Toucan is the highest paying symbol on the Island Style slot machine. 3 Toucan symbols on the payline will win you the 2400 coin top jackpot. The next highest paying symbol is a mere 150 coins. To try and win the 2400X top jackpot on the Island Style reel slot machine, sign up today at King Neptunes Casino! There are 7 winning combinations on the Island Style slot machine. The full payout schedule is as follows (1/2/3 coin payouts in parenthesis): 1 Cherry symbol (2/4/6), 2 Cherry symbols (5/10/15), Bar & Flowered Bar combo (5/10/15), 3 Regular Bar symbols (10/20/30), 3 Cherry symbols (20/40/60), 3 Flowered Bar symbols (50/100/150) and 3 Toucan symbols (800/1600/2400). Hit the “Expert” button to expand the number of options given to you by the Island Style slot machine. You can play 5 or 10 autoplay spins with a click of a button or you can hit the “Autoplay” button to open up advanced autoplay settings. You can set Island Style to play 5, 10, 25, 50, 100, 250 or 500 autoplay spins and set the number of seconds between spins to 0, 0.25, 0.50, 0.80 and 1.50. Stop settings available are: stop once all spins are complete, stop when jackpot is won, stop if a win exceeds or equals ($25, $50, $100, $250, $500, $1000 or $2500), stop on any win and stop if credits increase/decrease by ($25, $50, $100, $250, $500, $1000 or $2500). You can cancel autoplay on Island Style at any time. If you like a tropical flavour to your slot machines or maybe you just ate a bowl of Fruit Loops and are in the mood for something bright and colourful, you will enjoy playing the Island Style slot machine. It’s not custom-made for all types of slots players, but most casual players will appreciate the high frequency of small wins that the Island Style slot machine delivers. To play the Island Style slot game, please visit King Neptunes Casino! Are USA players able to play the Island Style classic slot game for real money? Unfortunately, players located in the United States are currently unable to play for real money at Microgaming online casinos. However, you can read our Triple Toucan Video Slot Review if you are looking for a toucan-themed tropical slot game to play. You can play the Triple Toucan video slot at Cherry Red Casino or read our Cherry Red Casino Review. Where can I play the Island Style flash game?